This building is known as The Old Post Office. 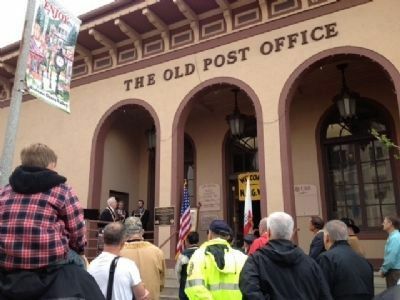 It was built in 1914 by the United States Government as the Grass Valley Post Office. From 1914 until 1984 the Post Office functioned form mail, package and gold shipments from the many mines in the area. After the Post Office moved to East Main Street, the building operated as an Insurance Agency in the 1980's and as professional offices since October 1989. The present tenants are: Law offices of Shine Compton, APC, Law offices of P. Scott Browne, Accounting offices of Connie Stone, CPA, Law offices of Curtis & Vander Ploeg, Law offices of Maralee Nelder, Law offices of Marsha Burch, Accounting offices of Michael Rath, EA, and Gold Country Court Reporters. Location. 39° 13.094′ N, 121° 3.711′ W. Marker is in Grass Valley, California, in Nevada County. Marker is at the intersection of S. Auburn Street and Bank Street, on the right when traveling north on S. Auburn Street. Touch for map. 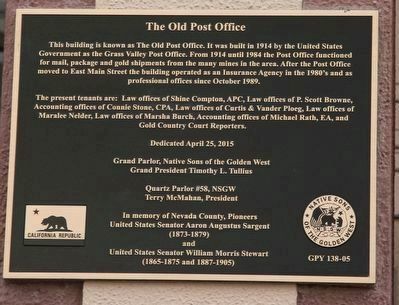 Marker is at or near this postal address: 131 S. Auburn Street, Grass Valley CA 95945, United States of America. Touch for directions. Other nearby markers. At least 8 other markers are within walking distance of this marker. Three Stamp Mill from the Red Ledge Mine (about 300 feet away, measured in a direct line); Grass Valley Hardware (about 400 feet away); Loutzenheiser Pharmacy Building (about 400 feet away); Williams Stationery Store (about 400 feet away); Washington Brewery (about 400 feet away); The Alpha Building (about 500 feet away); Madison Lodge No. 23 F. & A.M. (about 500 feet away); Chinatown, Grass Valley (about 500 feet away). Touch for a list and map of all markers in Grass Valley. 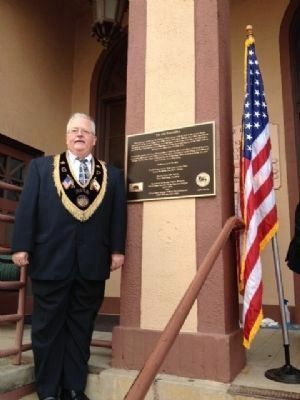 with the newly dedicated plaque. More. Search the internet for The Old Post Office. Credits. This page was last revised on June 16, 2016. This page originally submitted on July 18, 2015, by James King of San Miguel, California. This page has been viewed 272 times since then and 18 times this year. Photos: 1. submitted on May 7, 2016, by James King of San Miguel, California. 2, 3. submitted on July 18, 2015, by James King of San Miguel, California. • Andrew Ruppenstein was the editor who published this page.